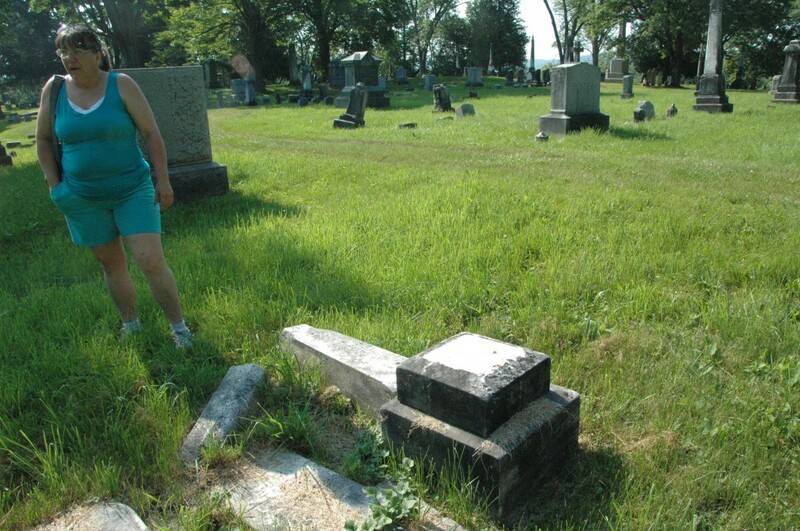 Marcy Gordon is concerned about the state of the Boardman Street Cemetery. When she visited the cemetery recently she was aghast at the site of toppled gravestones she believes were standing upright earlier in the month. Gordon is a volunteer for Find-A-Grave, an online resource that aids people in finding the final resting spot of forgotten friends and family members. A few times each month, she visits some of the area’s cemeteries taking photographs of gravestones, primarily for people conducting genealogy research. She’s visited cemeteries in Fair Haven and Orwell, Vt., Putnam, and most in Whitehall including Greenmount Cemetery and the Old Brick Church Cemetery. But none have experienced the type of damage the Boardman Street Cemetery has. “This is the only cemetery that’s like this,” she said. The cemetery, which is located on a grassy, tree-lined slope between Maple and Queen Streets, dates back to at least the 19th century. Many of the deceased who rest there were buried around the turn of the 20th century and it’s been perhaps as long as 15 years since anyone was buried there. Given its age and uneven geography, there are countless gravestones that have collapsed free of any human influence. But Gordon doesn’t believe age alone is the reason for all the damage. She says the Old Brick Church Cemetery and another behind the Armory are at least as old but in better condition. And the cemetery has been vandalized in the past, she said. She said the cemetery has been a haunt of local teenagers for the last two or three generations. A place youth can escape the peering eyes of parents and engage in youthful indiscretions. Even Gordon admits to having partied there as a youth, but the difference she says, is her generation wasn’t destructive or disrespectful. Jane Hewitt, whose house is on Maple Street, adjacent the cemetery, said there are teenagers in the cemetery two or three times a week, often in the early morning hours. “They’re up there at 12, 1, 2 in the morning. And they aren’t 12-year-olds. They are 17 and 18 years old, partying. They did lots of damage, terrible damage, three years ago, but they never caught anyone” said Hewitt, who used to occasionally walk through the cemetery but doesn’t get out anymore. The police have asked residents of the street to call when kids are up there, but most of the time it goes unreported, she said. Whitehall Police Chief Matt Dickinson said the department hasn’t had any complaints on Maple or Smith Streets in more than a month. Village officials said they haven’t received complaints of any recent damage in the cemetery. Stephanie LaChappelle did say landscapers have uncovered some damaged gravestones that had been lost under vegetation, but hadn’t heard of any new destruction. Neither had Mayor Peter Telisky, although he said he’d look into it. For her part, Gordon would just like to see the damage stop. “It upsets me when I have to tell people I couldn’t find the gravestone because they were tipped over,” she said.